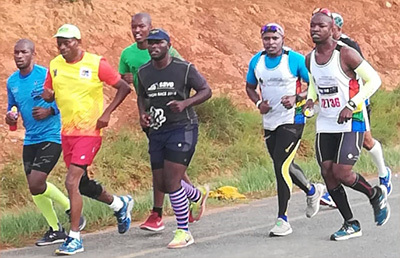 Members of the UKZN Athletics Club with other runners on 60km Bongmusa Mthembu Training Marathon which started at Impendle and ended at Bulwer on 29 December 2018. Held in partnership with Phantane Athletics Club and divided into distances of 50km and 60km, the tester run- scheduled to take place on Sunday this week (20 January 2019)- will be open to other runners external to the UKZN Athletics Club as well as members of the public who are also preparing for the grueling race which will be a 87km up-run this year. The race will be led by Mr Mduduzi Khumalo, UKZN Athletics Club Coach.